Everyday Fray: From A - Finally Finished! Way, way back in October of last year, I decided to make a quilt in a month....10 months later, my Salt Air Smitten quilt is finally done. 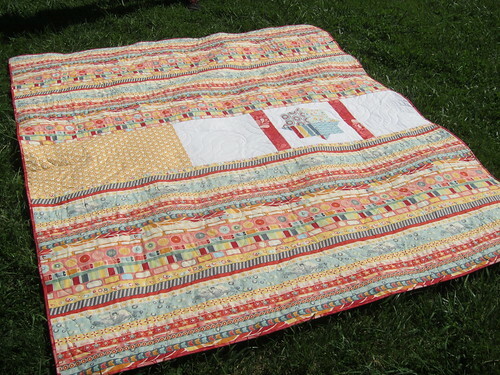 This was one of those quilts where I was constantly oscillating between loving it and hating it. Final verdict is love. 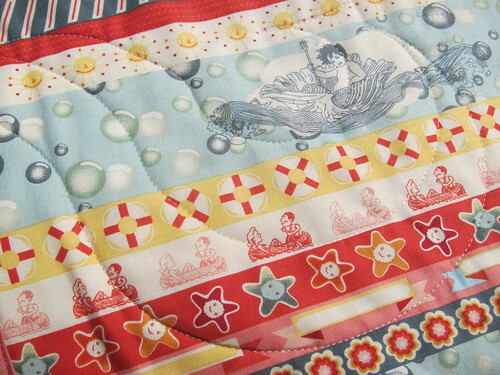 I love the primary colours, the outdoorsy theme (people in canoes, mermaids, whale tails, water, butterflies!) and the playful feel of the blocks make it a perfect choice for my good friend's daughter as she transitions into her "big girl" bed. The backing fabric is also from the Salt Air line. I had a temporary lapse in consciousness one day at my LQS when I decided to buy 5 meters of this super busy stripe fabric. I have no idea what I thought I would do with that much yardage of this particular print. Talk about crazy quilt back. I think that the strip in the middle helps tone it down just the tiniest little bit, but it is still pretty wild. 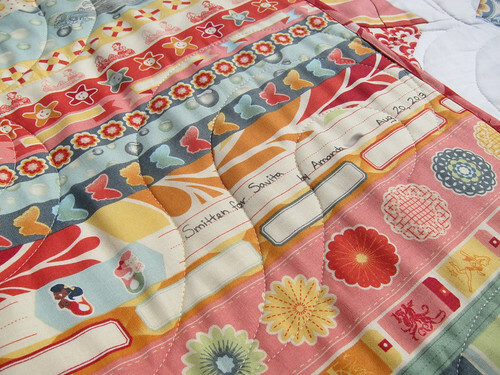 One good thing about this backing fabric is that it has built in spots to write in your quilt details. This was especially useful as the movers still haven't appeared with our stuff and I don't have any scrap fabric to make a label with. I also like that it's a little more subtle than having a stand-alone label. I made a few mods to this pattern. First I added a fifth row of blocks to the quilt to get something that was a little more bed shaped instead of square. I also changed up the borders and made them all different widths so that they move from narrowest to widest out from the middle of the quilt. This is my first machine bound quilt. I used this tutorial. I had tried to machine bind my Posy quilt but didn't like how much the binding was overlapping on the back and ended up stitching it by hand. This time, I cut my binding strips to 2" instead of my usual 2.25" and that seemed to do the trick. It was slow going but overall, I am happy with how the machine binding turned out. 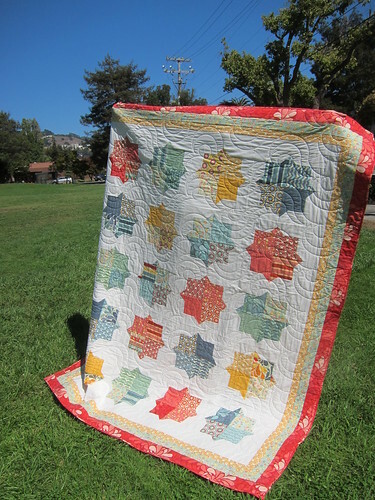 This quilt is also the first time I sent a quilt to a long-arm quilter to be quilted. Let's just say that with a quilt this size, it was a good decision. This would definitely still be in the WIP pile if I had to face the prospect of shoving this through my machine to try and quilt it myself. Also, I'm a big fan of the wave pattern Lindsay used. I think it ties in nicely with the quilt without making it too busy. 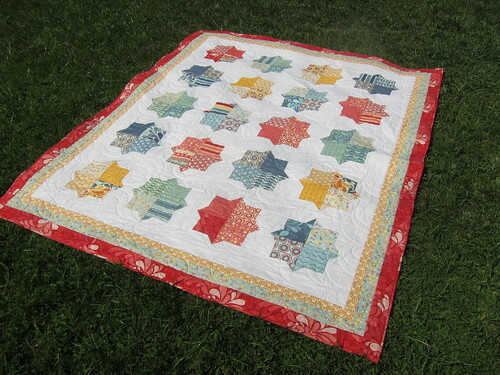 Here's a better photo of the overall effect of the quilting. You probably figured from the sheer number of photos in this post that I'm glad this is done. I know that my friend's daughter will love it to pieces. Linking up to Finish it up Friday at Crazy Mom Quilts. Take a look-sy. There are some beautiful things there this week. 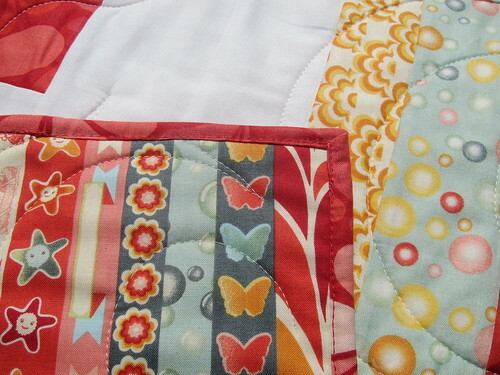 It's great Amanda, and I love the quilting. oh! definitely love it! it's so cheery and summery! Congrats on a wonderful finish, Amanda! Your mods are a winner. 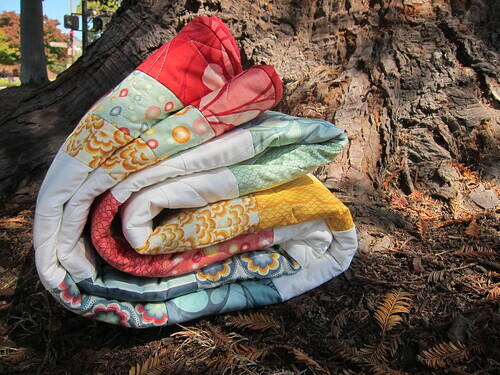 I am a big fan of quilts that fit beds! Ha, ha! I know the 'little' girl will be entranced by all the things to see in these prints. Bravo on the machine binding! It will get easier each time. What a great finish! So cheerful. I really like your mods and the nautical touches. And that wave pattern kind of echoes the shapes in your outside border fabric. Very nice finish! I actually really like the busy backing fabric. I have a soft spot for BUSY, and backings are usually the most appropriate place for that kind of thing :) Love Salt Air, love the pattern you chose, and I love the most that this is not too girly-girl. The corals and blues and teals will be so nice in a big-girl room! It looks fantastic Amanda! And i love your borders, just perfect! I love this!! I just bought this pattern too, but havent gotten to it yet. I love the changes you did to the pattern. It turned out just lovely!! 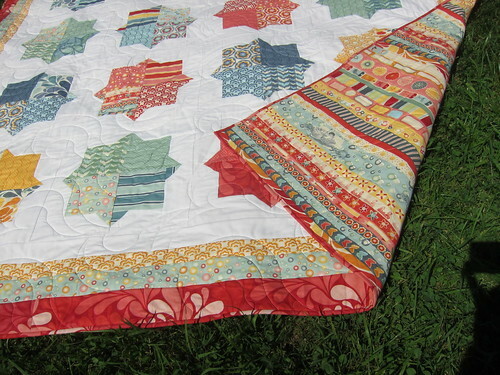 That is a lovely quilt - I love the colours too and the backing sets it all of nicely as does the quilting pattern! Well done! Amanda, this is so beautiful! I actually love the back. I like the back to be a little wild:) I look back too and wonder what I was thinking too sometimes,lol. I just had this thought today that I need to use my fabric quick before I decide I don't like it anymore! My last quilt I switched to 2" for binding and I really liked it too. Just enough. Very adorable. Love that it's decidedly not girly. Also seems like you could look at it a long time and discover all sorts of fun things. Beautiful. I'm sure your friend's daughter will love it and I also really like that it's not particularly girly. Nice work on the machine binding - I've tried it a few times and I just can't quite get it to look neat enough for my liking. 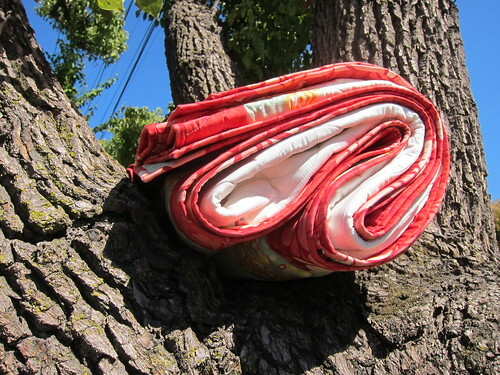 It's probably a better option than handstitching for a child's quilt that's likely to see a few washes though.